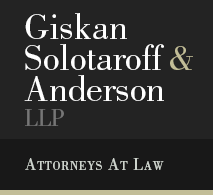 The New York City employment lawyers of Giskan Solotaroff & Anderson LLP represent employees in employment and civil rights matters, consumers and small businesses in class actions, individuals and small businesses in commercial litigation, and individuals in white collar criminal defense matters. We are a small firm which has consistently delivered big results for our clients and, in our class actions, for consumers and small businesses injured by deceptive and unlawful conduct. Please contact us to arrange for a consultation at which our New York City employment attorneys can discuss your case. Reverse Mortgage Lender Live Well Financial and Servicer Celink Sued for Practices That Increase Risk of Foreclosure for Older Homeowners Class Action Suit Charges That Reverse Mortgage Lender and Servicer Cause Homeowners to Accrue Thousands of Dollars of Debt Central Islip, N.Y.
GSA attorney David Feige recommends that courts "treat criminal cases more like civil cases" as a way of alleviating endless waiting for jury trials and verdicts. - The New York Times - The Opinion Pages.